From the people that I speak to in the real world and also via Twitter, there seems to be a common misconception that everyone who owns a smartphone immediately becomes an expert in how to extensively use that device, including the ins and outs of app installation. I know first hand that this simply isn’t the case and to a lot of people, a smartphone is just simply another mobile device and they are unable to make a distinction between a normal phone and a smartphone. However, with mobile devices being such a big business these days, there is a growing number of people who love to learn everything about the devices and the operating systems which power them. The need to interrogate the hardware and software also means that the most intermediate and advanced user will be familiar with extracting installed applications from the phone in their .apk or .ipa format depending on whether it is an Android or iOS device, respectively. Users who class themselves as Android gurus will certainly not have any difficulties pulling off the. apk file for all of their installed applications and for those who may not be familiar with the processes involved, plenty of tutorials exist on the world wide web to show you how. It is a growing trend that some users like to make copies or store the installation file for the purchased or downloaded applications. But what if you don’t want to go through the laborious task of downloading the app to your device, then pulling off the .apk and storing it? What if, for example, you wanted to navigate to the Android Market via a desktop or laptop computer and download the installation file directly to be able to store it? Thanks to a developer known as redphx, that sweet dream just became a beautiful reality. Redphx has released a Google Chrome extension known as APK Downloader which allows users to download and run, to accomplish that very task. 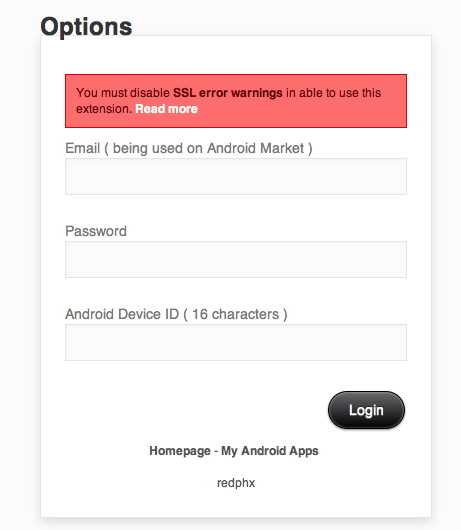 APK Downloaded requires the user to turn off SSL error notifications and then set a cookie containing the user’s Android Market e-mail address and their Android device’s ID. This may be a show stopper to some security conscious users as it means that they have to give up some sensitive information to the developer’s cookie, but to others it won’t be a problem. Once this set up has been established, it is a simple case of finding the desired application on the Android Market using the Google Chrome browser and clicking on the APK Downloader icon which appears on the right hand side of the toolbar. Once downloaded, the .apk file can be saved and stored at the user’s discretion. We are pretty sure that if/when Google find out about this extension, they will have some something to say about it as I am sure they wouldn’t look so kindly on users pulling the installation file directly from their Market, but for now APK Downloader does exactly as it says on the tin.